George Lucas has donated a Skywalker Ranch fire engine to the Muir Beach Volunteer Fire Department. 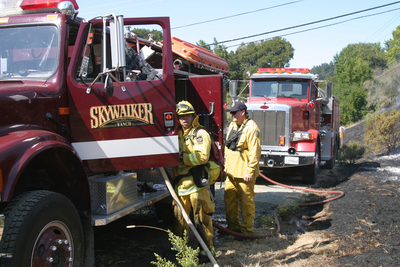 Filmmaker George Lucas has donated a fire engine from his Skywalker Ranch to the Muir Beach Volunteer Fire Department. The department had been negotiating to buy the rig from Lucas — a purchase that would have wiped out its annual budget for safety equipment — when Lucas decided to make it a gift. And the good deed doesn’t stop there: Muire Beach is donating its aging fire engine to a volunteer fire department in Plumas County. The Santa Rosa City Council voted to allow private ambulances to use technology that remotely triggers traffic signals. The goal is not necessarily to help ambulances move faster through intersections; changing lights ahead to green also clears intersections better, thereby increasing safety. City fire engines and police vehicles currently use the technology at 128 intersections in Santa Rosa. A business executive from China has purchased Napa’s Bialla Vineyards, the latest in a trend of such investments. Former owner Vito Bialla said he decided to sell because of the difficult business climate and the red tape challenging small wineries. He noted that many of the nearly 20 prospective buyers were Chinese. Future plans for the winery may include a new brand name and exclusive sales to China. Despite its landmark status, demolition work began this week on Berkeley High School’s Old Gymnasium. The local school district OK’d the demolition after rejecting proposals to make needed seismic upgrades. Plans for the site, known as the South of Bancroft Project, includes a fitness center and new classrooms. Construction is scheduled to begin this fall. Some Walnut Creek residents are clamoring for bovine-based fire protection. After cattle grazing was outlawed two years ago in the Acalanes Ridge Open Space, grass there has been especially plentiful. The city brings in grass-eating goats to reduce the fire threat, but only after determining the areas in greatest need. This has some nearby residents worried, and many are calling for the cows to come home. Google Inc. descended on San Francisco — literally — for its annual developer conference, called Google I/O. Skydivers gave an amazing demo of Google’s Project Glass (augmented reality glasses) by parachuting onto Moscone Center and then joining Google co-founder Sergey Brin onstage during his keynote speech.